I ran across an interesting article not too long ago, "The Infomocracy Dilemma: Revolution or Disengagement?" I thought it quite perceptive in regards to the mess things are in, and quite timely considering the increasing unrest of late. What especially caught my attention, was the phrase "enlightened disengagement." That got me thinking. In centuries past, when a people disagreed with their government, they had options: revolt, change it from within, or leave. For this nation, we probably first think of the Pilgrims, the Separatists actually, who saw nothing for it but to separate from an oppressive government and start over on their own terms. Their contemporaries, the Puritans, believed they could "purify" the church/government from within, although ten years later, they started heading for the New World as well. Later, it was revolt, for reasons stated in the Declaration of Independence. After that, it was go west to new territories and undeveloped lands. I do not believe any of these are viable options in this day and age. Revolt will only result in another greedy, power hungry government eventually, history shows us that. Changing from within is what the democratic process is all about, but look at where we are now; one party treats us like a bunch of dopes, the other patronizes us at every turn. In the end, the only difference between them is semantics. For the public, it's all a game, a show. I have finally concluded (with no apologies to Karl Marx), that politics is the opium of the masses. It keeps us divided and distracted. The last option on the list is migration, but now, there's nowhere new to go, and no, I'm not standing in line to be one of the first colonists on Mars. 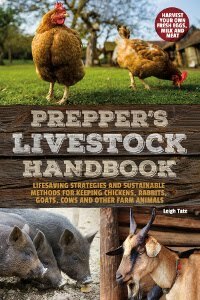 One thing we have seen, is a lifestyle phenomenon called homesteading: rural, urban, and in-between. It isn't within the boundaries of any one political party, religion, philosophy, race, or sexual orientation. The reasons for embarking on it are many. The one thing we all have in common, is that it offers a sense of "doing something about it," as well as hope and a source of security in uncertain times. 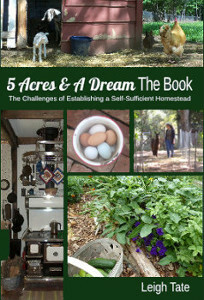 A common theme amongst homesteaders, is self-sufficiency. The problem is, of course, that we're still dependent upon the system. We all know that, and seek to cut or at least minimize those ties. We grow our own food and seek energy alternatives. Those things certainly help and give us a greater sense of freedom, but aren't the heart of what keeps us bound to the system. I'm going to suggest that there are three things that ultimately prevent most folks from truly disengaging from a culture that is failing many of us. Those things are debt, insurance, and retirement investments. Debt. All kinds, because the things we owe on, don't really belong to us, i.e. they belong to the person or institution that loaned the money to obtain them. Another way of looking at it is, my paycheck really isn't mine if I'm in debt. The amount I owe belongs to the lender. I'm allowed to keep it because the lender profits on the interest, and hopes I'll purchase more debt. If the borrower defaults, the lender has the legal, and moral I might add, right to take take it back or collect the debt. Unfortunately they go beyond that and ruin our credit ratings, increase our interest rates, and impose unrestricted fees and penalties. Avoiding all this is what keeps us in line. Of course, if we have no debt, there's no line to tow. Insurance, all types. Some folks think this is a necessity but personally, I've never had an insurance company do what I paid them for, not without a battle, which was usually a losing one. I think the deception here is that folks think they are purchasing a service, when in fact what they mostly get for their money, is a sense of security, but with no guarantees. Auto insurance is mandated by law; a guaranteed income for the auto insurance companies, and the lawyers one must hire to get them to pay out on claims. Health and life insurance is packaged as a "benefit," but the only ones who seem to benefit are the insurance providers and pharmaceutical companies. And soon the government. "What if" fears keep us locked in here. Retirement investments. Actually, I could say all investments, except that not everyone has money to invest. Most folks though, feel a retirement account is a necessity. Again, it's a sense of security that has no guarantee. The problem, of which there is an increasing awareness, is corruption in the system. That, and that our perceived wealth from investments is actually a number system rather than real money, as (for example) those who lost it in the 2008 wall street crisis know very well. Now, you might agree with me on these points, then again, you might not. I'm not going to argue or debate their individual validity, because I think each of us has the right to our own opinions and our own choices concerning them. This just happens to be my opinion, based on my own observations of what's going on around me and my personal experience in these areas. My point, is that I think these are things which keep us from truly disengaging from the system, if that's what we want. Either way, depending on how we view the future, these might be things we need to consider. High at the top of our kitchen remodel project list, is to install the wood cookstove. After finishing the ceiling beams, Dan was ready to start on this, but I hadn't finished stripping, sanding, and painting (which turned out to be not such a brilliant idea after all) the wall behind where the stove will go. No sweat. While I worked on that, he tackled another project on the list, relocating the pantry door. This is the second door we've moved for our new kitchen, the first being the back door. This second door was to the three rooms added on to the house after it was built; the part of the house I call "the addition." the addition was added on to the house. 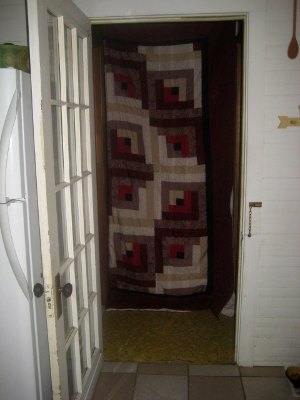 Quilt (not handmade) hung over pantry entrance. ..... beyond the bathroom door, because the pantry does not need to be heated. This helped somewhat, to keep warmth in the kitchen and bathroom, and for this reason I wanted a permanent pantry door. Since I liked the French door and we already had it, I thought the best thing to do was to move it. It was easy enough to take the door off the hinges and pull the whole frame out once the moulding was removed. We chose a spot in the hall, beyond the bathroom and utility room doors. Dan found a stud in the wall and framed out the new location. I wanted the door to open toward the pantry, so he turned it around and put the hinges on the right hand side. Old door, new location. I like it. Here it is, just finished. The bathroom is on the left, the utility room is on the right. One special touch Dan added is the shelf above the door. I have a lot of nice knick-knacks, and this will be an excellent spot for some of them. Lastly, I painted this short hallway the same color as I am the kitchen. It's a soft off-white that coordinates with my wallpaper. When we install the kitchen floor, it will extend into this little area as well, to give a look of continuity. 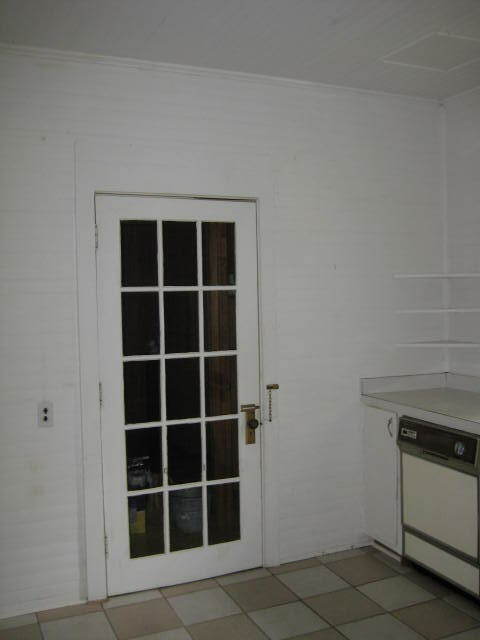 The ugly paneling and vinyl flooring in the pantry will probably stay as is. The door is already doing its job to help keep the kitchen and bathroom warmer. Since it has hardware for cafe rods, I can also increase insulation value by hanging something quilted over the glass panes. Or something lacy to let some light in. Either way it'll help hide my mess in the pantry! Yes, I did get the expensive wallpaper that I fell in love with (Kitchen Remodel: The Perfect Wallpaper). I found it deeply discounted online, though the shipping and handling knocked it out of the bargain box. I plan to give the dining nook a chair rail look, using the green on the lower portion of the wall, separated from the expensive stuff with a cheap, but coordinating border I found at a big box store. Of the plate, I have to say that I couldn't resist because I will be needing new kitchen dishes. My 30 year old set of Corelle is down from a service for eight, to two dinner plates and three cereal bowls. The Blue Willow is for good dining room use, so I need something for breakfast and lunch in the kitchen. The pattern on the back of this plate says is "China Pearl, Olive Garden", and I would love to have a set. Unfortunately, I couldn't find it online. Doubt it would be in my price range anyway. :) I did find the following however, at the dollar store. Not as pretty, but the theme and colors will match my new kitchen, don't you think? "Yes, I know you're remodeling the kitchen. Yes, I know you're stripping and scarping and painting. Yes, I know you don't want paint chips to fall into my catfood." isn't edible in any other part of the house." Sue was curious as to what I was going to do with the basketful of green tomatoes I picked after our killing frost. Some we'll let ripen on the kitchen window sill, and some I'll chop up to add to things like scrambled eggs. The rest I wanted to preserve, I just didn't know how. A common solution would be green tomato pickles or relish. Well, I still have plenty of pint jars of the green tomato salsa I made last year. Pickles we only need so much of and I have plenty of those too. Several recipes on the internet interested me, one for green tomato jam, another for canned green tomatoes for frying, over at cooks.com. I found a recipe for green tomato mincemeat too, in Putting Foods By, but I didn't have all the ingredients for that. We have plenty of jam, but I thought fried green tomatoes would be a tasty, special occasion winter treat. ... but wasn't entirely sure about "fairly thick." I usually slice them about 1/4 inch for frying fresh, so I went a little thicker than that, about 1/2 inch. The slices were packed in wide mouth quart jars with 1 teaspoon canning salt. Since I was uncertain of the acid content of the tomatoes, I added 1/2 teaspoon of citric acid to each quart to be on the safe side. (You could also use 1 tablespoon lemon juice) I filled with boiling water, leaving about a 1/2 inch headspace. Seven quarts were processed in a boiling water bath for 40 minutes. No floating, no loss of liquid; I was pleased. I also read somewhere that green tomato slices can be frozen for frying as well. I don't have much room in my freezer, so someone else will have to test that one out. How they'll fry up remains to be seen [UPDATE 1/25/2012 - they were delicious! See my related post below]. We can eat tons of fried green tomatoes, so a quart will amount to a just tasty bite of a side dish. Still, it will be a treat. At least it used up my largest green tomatoes, so now all I have to do is decide what to do with all the smaller ones. I sometimes lament the course of my homesteading life. Not that I regret having our place and what we're doing now, I just wish we'd been able to start earlier in life. As empty nesters and first time grandparents, it seems to be a bit late to be getting started. Or perhaps I should say to return to it. My first experience (way before Dan), was back in the 1970s, although we didn't call it homesteading back then. Then, it was back to the land. And we didn't live off-grid, we just didn't have electricity. Why I left is another story, but those three years of my life laid a groundwork that has influenced me everywhere else I've lived. I was reflecting on that as I prepared for this post. Back then, having water meant digging out a mountain spring and gravity feeding the water to a faucet in the outdoor kitchen. Since then, we've lived with city water and well water, and have learned the benefits and problems of both, including emergency situations. We have city water now. About the only benefits to it is that it's convenient and still works when a hurricane, ice storm, or tornado knocks out the power. But it comes with a monthly bill, chemicals, and other contaminants. These effect not only taste and smell (ours is terrible on both counts), but also what we have to ingest. Well water on the other hand, varies in taste according to location. The best we ever had was naturally sand filtered when we lived in central Florida. Nowadays well water is accessed with an electric pump, so if one's electricity is down, guess what. No water. We learned that a 55 gallon drum of stored water lasts a family of 4 for only a couple of days. Well water is not necessarily free of chemicals and contaminants either, it depends on the groundwater source. Also, we found sediment and pipe corrosion to be higher with well water. Still, if I had a choice, I'd choose well water over city water any day. We know that when our home was first built in 1920, there was a well. We just don't know where it is. Old surveys didn't indicate things like that. Our neighbor's was where his driveway is now. He discovered it when it created a small sinkhole that tried to swallow one of their cars. He had hoped to use it for watering their garden, but alas, it was dry. Water is an area we think important to us in a self-sufficiency sort of way. We have plans for both rainwater and greywater conservation systems (see my Assessing for Water Conservation Systems post). These are slow to implement because of time and resources (one of the reasons I was lamenting), though time on the project so far, has been well spent in research, assessment, knowledge accumulation, and planning. And Dan talks about having a well dug for us. Someday. If we're allowed. One thing that we figured we could do in a more immediate sense, was to filter our water. Like everything else, I did a lot of research and Dan even went so far as to talk to a few sales reps. If we had well water like we used to, he would have wanted a whole house filter, but with city water, we felt our concern should focus on water for drinking and cooking. The factors we considered were contaminants filtered out, life of elements, non-energy consuming, maintenance, and price. For us, a Berkey best met our needs. The clincher was not the sales pitch, but the fact that it is a common unit on the mission field, where it is being used successfully in primitive conditions, to provide potable water from sources that none of us would otherwise dream of drinking. I'm not trying to promote this brand, I'm just very happy with the choice we made. It suits our needs and circumstances. We noticed a difference in the taste (and smell) right away. Not to mention a sense of relief at being able to drink pure water. I'm also confident we are better prepared for a water emergency, as long as we have a source of water to filter. That's peace of mind. Mama Pea (who recently finished her own kitchen remodeling project) asked what I'm using for a kitchen right now. Our kitchen is pretty much an empty room now, except for the fridge, and the sink and it's cabinet (which came in handy to stand on when we put in our decorative ceiling beams). Both will be removed soon. The electric stove and former peninsula have been moved out to the back porch. My canning & summer kitchen. Good for remodeling too! For early morning convenience, the coffee pot and toaster oven are in the dining room. I put the green kitchen island in here just for these. I also moved the brown shelving unit you see above, out from the kitchen to use for dishes, glasses, mugs, cookbooks, cereals, chips, crackers, etc. Everything is convenient for breakfast and lunch. I admit it's not a set up I'd like to use for very long. Still, it's so much better than eating only soup heated up on a hot plate and washing dishes in the bathtub like other remodelers have had to do. We are trying to keep meals simple, to minimize time and clean-up. So far it's working out pretty well. For the most part, our plans for remodeling our kitchen focus on repair, function, and practicality. Some things though, are purely decorative. One thing we liked in the various kitchen idea books, was the look of ceiling beams. Initially, we liked the idea of four, 4x6 beams, evenly spaced across the ceiling. When we considered price and weight, we turned to 4x4s. We also looked into faux beams, but woo-wee, those are expensive. In the end, we settled on four, 2x6s, to give the look of exposed ceiling joists. We figured we would space the "joists" at 27 inch intervals so that they would be visually symmetrical. What we hadn't realized, was how uneven our ceiling is. Not just sloping, but it bows and dips in several different places. When we held a board flush and level to the ceiling, there were gaps of up to an inch and a half against the wall in some places. Ah, the remodeling joys of a 90 year old house. 1st two decorative 2x6 "joists" in place. Tearing down and re-doing the ceiling was not an option, so the next best thing, was to choose the two most level, equidistant places on the ceiling and put two of our "joists" there. The other two went against the outer walls (which were level, amazingly), as you see in the photo above. This meant wider spacing of the "joists," but we figured adapting was the easiest of our choices. This decision actually solved another problem for us, that of moulding. Our walls and ceiling both, are tongue and groove, and the individual boards make an uneven gap where the walls and ceiling meet. Unlike drywall, which can be taped and gooped, T&G requires moulding to cover that gap. The "joists" against the walls serve as moulding, while giving the look we were going for. Notches were cut from a 2x10 to fit each of the beams. This is how it looked after we got it up. 2 dowels were cut to serve as pegs to secure one of the 2x6 beams. The "joist" had two holes drilled into the end, which slipped onto the pegs. After ..... and the opposite wall. We had our first frost on October 30th. It was a light frost, and most of my tender plants like sweet peppers and volunteer tomatoes, avoided heavy damage. We had another the next night and all was still well. The third frost last Friday, was the killing frost and did them all in. After the killing frost, I harvested the green tomatoes, green peppers, and volunteer potatoes. The peppers were from purchased plants, the tomatoes from a volunteer that grew in one of the front yard herb and flower beds. The potatoes were volunteers scattered around the garden. After the killing frost, we finished winterizing the billy barn. Chinked, with window coverings and wind block. Awning can be lowered at any time. Our days have been lovely really, usually sunny with lows in the 30s and highs in the lower 60s. But we've had some cold winds blowing out of the northwest, and those frosts remind us that winter is right around the corner. The boys now have a snug spot to protect against wind, snow, and rain. After the killing frost we lost Katy. The vet said her symptoms were consistent with poisoning, though the source is a mystery. A favorite photo of my sweet, silly Katy. She's the only kitty I've had in the last 22 years that wanted to be a lap cat. I am so going to miss that. In Part 1, I asked readers to participate with their own thoughts and experiences, and Part 2 shares these with you, as well as some links I found on the subject. As might be expected, folks have various comfort levels with the barter system. Some still prefer money, but some pretty amazing trades are being worked out. I'll first share with you what folks are trading, some of the problems readers experience, and then will pass on the advice of the successfully experienced. (You can read the comments in full, i.e. not dissected, at "The Lost Art of Bartering, Part 1"). "....Turns out she also has a couple of sheep, although she's very new to them, and would talk to her husband about trading the two pigs for my last terminal ewe lamb. ..... I ended up picking up three pigs" Sittin.n.Spinning, from her post "Porcine Paradise"
Problems people have: I've tried to categorize these as best I can. "We barter alittle on my little place but I find it easier at times to sell my eggs and hens/roosters because it is the end of the transaction. With my friends I have tried the bartering "my time" by helping out at their place and they will come and help out at my place. With some friends this works out but with others...their coming to my place never happens." Connie, C and C Antiques and Animals - What a Life! "I love bartering and have spent years doing it on both ends. I use to do antique shows in New England with fine linens. Anyway, I have a few rules I live by when bartering. The first is, remember that this could be someone's livelihood and always be polite. I always ask if someone has a bit of room in their price and then give my offer. They may come back with a counter, take it or say they just don't have enough to barter on the price. I've found the best deals are those in which each party walks away feeling they got a fair price. I don't like to beat people down and I don't like those that tried to beat me down. Many items under $5, I don't barter at all unless it's books or I want multiples. "If they have a higher ticket item I want, I'll save my bartering capitol for those. And if something is a steal, take it at asking price or be honest. I found a set of pearls, good pearls, thrown in with costume jewelry at an estate sale. Simply put, I could not and would not buy them for the $6.00 and pointed out to the family that the clasp was gold and the pearls real and they would be better served by pulling it and having it appraised or selling it at jewelry place that buys estate pieces. "Lastly go prepared. If you are looking for furniture or find a large treasure, don't ask someone to hold it while you check measurements etc. Know your needs, real or imagined. If you go to a true auction, which I have done many times, set your limit on each lot or piece you are interested in, avoid a bidding war at all costs if you can. Many times it's dealers but once in a while it may be a young couple starting out and I try to defer to them if I can. I mean I've been there. Of course if you are in love with something, then go for it. Go as high as you need to and end when you either get it, or can walk away and not feel regret. Some of my most loved items are ones I paid a lot more than I wanted but because I love them so much I have never ever regretted the purchase and most I would have gladly paid more for. Interested in more on the subject? Candace (The Weekend Homesteader), mentioned that there are some great barters on The Waltons TV show. A good excuse to watch TV! One thing I've noticed as I study kitchens in books and magazines, is that I rarely see kitchen towels in the photographs. There might be an occasional tea towel laid casually on a countertop, or over the back of a chair, but in general, kitchen towels are nowhere to be seen. Before our kitchen remodeling project began, my dish towels had a specific place fairly near the sink. This has always been the case. Remodeling plans put the refrigerator in that corner. It sticks further out into the room, so my little towel rack will no longer fit in that spot. I might not have noticed the absence of kitchen towels in modern designer kitchens, except that once we finalized a general kitchen plan, and I started working on where things will need to go, I began to study the photos more closely. Each time I would focus on a different detail and eventually realized I rarely saw dish towels. 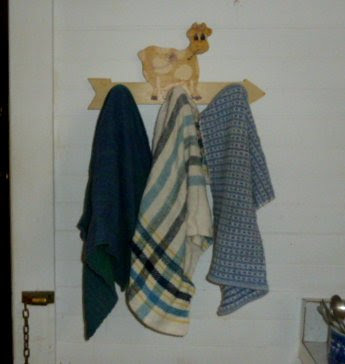 One "clever" idea I saw, was sliding towel rods on a track (sample photo here). This is installed inside the cabinet. My first thought was, "not with our humidity!" 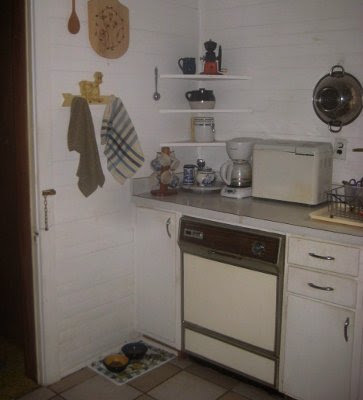 Besides, our kitchen is too small to sacrifice the cabinet space. 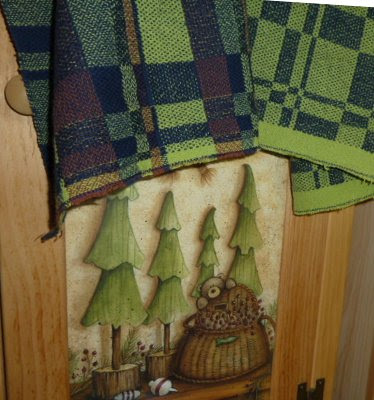 Then too, my kitchen towels are a decorative feature in my kitchen; they add a handcrafted touch and a dash of color. I don't know. Perhaps it's expected that everyone uses their dishwashers and dries their hands with paper towels these days. I have an idea or two about where I might hang them in my remodeled kitchen, but reckon I'll have to wait until the wall cabinets are up to be sure. For the weaverly amongst you, details on the handwoven dishtowels in the above photo can be found at my fiber journal, here for the one on the right and here for the one on the left. The weave structure is Summer & Winter, one of my favorites. I wove them about 4 and 1/2 years ago, when we were temporarily apartment dwellers and weaving helped me keep my sanity. I'm thinking I'll need some coordinating rag rugs for the new kitchen floor, so hopefully I can get back to weaving soon; maybe once I clear all the boxes of packed up kitchen stuff out of my studio. In the mean time, I'm working on getting these hemmed, and enjoying the opportunity to relax with some handwork. 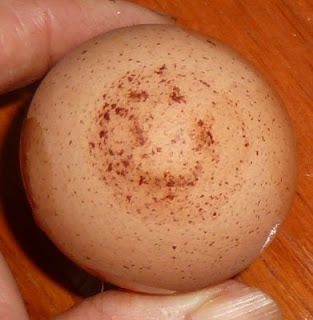 And now, for your viewing pleasure, (and because I don't have The Lost Art of Bartering follow-up ready for you), here is my collection of Welsummer Egg photos. More on the breed, below. Welsummers are a Dutch developed breed, introduced to the US and Britain in the 1920s. 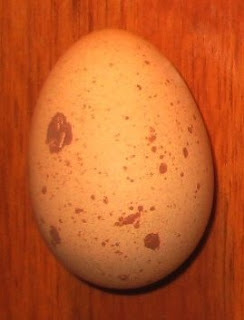 They are noted for their dark brown and speckled eggs. 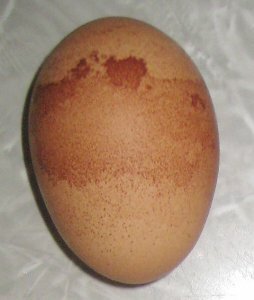 Egg coloration and markings are completely random, so that no one hen lays a consistent color or speckle pattern. That makes them all the more fun to keep. One of my Welsummer hens. We've had three Wellie hens. None of them has been particularly friendly, and usually run away if I get near. They are probably the noisiest of our hens, and will carry on at length when announcing egg laying or anything else of general interest to chickens. I've read they aren't particularly prone to broodiness, though reports on that are mixed. 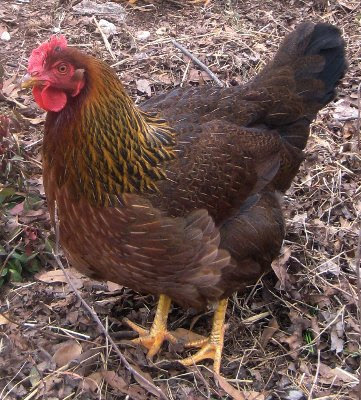 From experience, a Welsummer was the only of my 4 breeds to go broody this past summer. She was an excellent mother. We also had three Wellie roos to start, but I was not particularly impressed with them. They are quite handsome, looking just like the Kellogg's corn flakes rooster (who is rumored to have been a Welsummer). However, they were the first to run away at any sign of something strange or scary. This did not (in my opinion), make them good candidates for the flock rooster. Since Welsummers are a dual purpose breed, ours went to the freezer. Like other dual purpose chickens however, one can't expect the heavy, meatier breasts of the meat breeds. One other tidbit of interest about the breed, is that the chicks can be sexed at hatching, because of markings on the head and eyes. Would I recommend the Welsummer breed to others? Definitely. Would I get them again? Based on our experience, probably not. Do check the comments though, because others have had different experiences with this breed. I'm glad we got some as part of our original flock, but for us, they aren't our personal preferred breed. We're still looking for that.